Related to the preparation of reaccreditation of MD FEB UGM, on September, 20th 2018, MD FEB UGM inviting the Quality Assurance Unit (QAU) of UGM to get insight about the change that will be faced regarded the national accreditation (BAN-PT) for all study program of Indonesian universities. 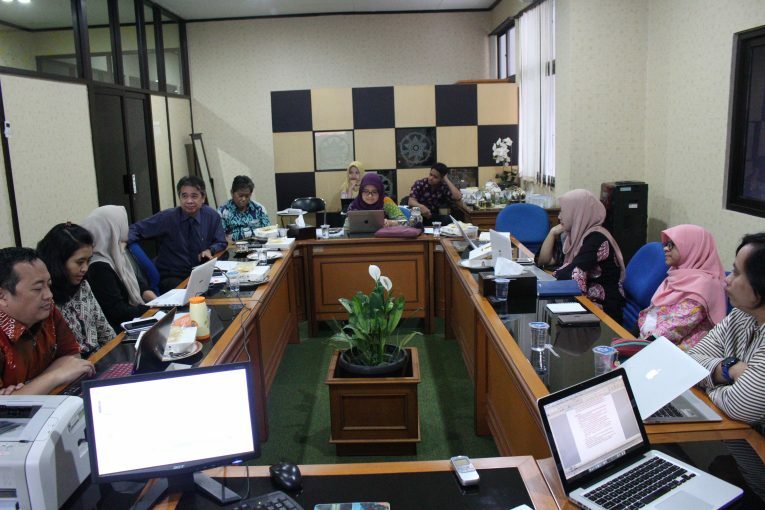 The joint meeting was conducted at council room of MD FEB UGM. Professor Indra Wijaya Kusuma, M.B.A., Ph.D. as the head of QAU of UGM accompanied by his senior staff Rosi Setyorini, M.Sc represented the QAU of UGM in order to explain the information related to the instruments of outcomes-based education, as the main part of the IAPS 4.0, which will be apply on the 1st January 2019. Nurul Indarti, Sivilekonom, Cand. Merc., Ph.D as the director of master of science and doctorate in management program and Professor Dr. Catur Sugianto as the director of master of science and doctorate in economics program welcoming the QAU of UGM team. The manager of master of science and doctorate program, RR. Tur Nastiti, Ph.D was also attended the meeting. Professor Indra Wijaya Kusuma, M.B.A., Ph.D. start the meeting by explain at least five significant differences between IAPS 3.0 and IAPS 4.0. First, the one that will be act as the proposer of the accreditation is the management of the study program, not the study program itself. Second, IAPS 4.0 will is using 9 criteria (vision, mission, goals, and objectives; governance system, management and partnership; student; human resources; teaching and learning; finance, asset, and facilities; research; public service; and outcomes and output). Third, IAPS 4.0 is oriented by outcomes and output. Forth, IAPS 4.0 consists of self-evaluation report and academic-performance report. Fifth, the level of accreditation in IAPS 4.0 are good, very good, and excellent. An additions to 9 standards (from 7 standards) in IAPS 4.0 is emphasized on outcomes-based education (OBE). For the record, UGM itself still not usual with the OBE, whereas not all study program in UGM implemented OBE yet. Accordingly, QAU of UGM was informed that UGM will be conduct many training and workshop to disseminate OBE concept, and it is important that all study program under UGM send their staffs, including MD FEB UGM, to join the training and workshop. Meanwhile, QAU of UGM was on process to design the outcomes-based education assessment (OBEA) as a part of effort to disseminate the OBE. On this joint meeting, Rosi Setyorini, M.Sc also deliver the technical mechanism to do the files submitting using SAPTO, the information system that used to get the accreditation. Rosi emphasized that at least nine months before the previous accreditation expired, all the study programs are expected to send their accreditation files to QAU of UGM, so then the QAU can process the files to the SESA (Self Evaluation Similarity Assessment) and do the simulation check of the accreditation, and finally, submitting the accreditation files to SAPTO together with the study program. Rosi also add some information that MD FEB UGM that consists of 6 study programs are estimated should submitting their accreditation files in June 2019 to the QAU of UGM.